The Giles family lived here for well over a century. John Giles, a tailor and his wife, Charlotte, a milliner, had their two children here when it was simply called Westall cottage. Theophilus and Isabele were born in 1837 and 1839 respectively. It seems likely that the house was at some time divided into two, as when Theo married his wife Hepzibah they continued to live here and raise a family of their own. ​Theo, a glass cutter by trade, and Hepzibah had four children - one son and three daughters. Their son, Gideon Charles, was born in 1869 and became a fine craftsman. Known as Charles, he shared his carpentry skills with the pupils of Glyngarth school, teaching there for fifty years. Charles had three sisters, Hepzibah, Isabel and Charlotte and it seems that one or all of them continued to live in the adjoining property after their parents died. Charles died in September 1948 at the age of 80 and is buried in Leckhampton churchyard. The whole property was then sold, one part becoming residential, whilst the other (now 125) became the Kington Economy Laundry Ltd, followed in the mid-1960s by Border Cleaners. This was just a collection point for the laundry which was located in Herefordshire on the border with Wales – hence the name Border Cleaners. 1 & 2 Westall Place are now part of Moran's restaurant. The turn of the 20th century saw Westall House as the home and business of Mr F J Wright, an ironmonger. Five years later it appears that the property was divided into two. The end part became the premises of Mr T Haines, with his Haines Cycle Depot, and the other part was the business of Mr H S Clarke, a sanitary engineer. Charles Lord took over the cycle business from Mr Haines and traded from here until he moved across the road in about 1912. By 1916 both of the properties, (by now numbered 20 and 22), were in the occupation of John Sutton, remembered by one lady as a very handsome elderly man! Mr Sutton dealt in both pedal and motor cycles and by the 1920s also sold good second hand furniture. By the end of that decade John Sutton, whilst keeping the adjoining part for his family, had sold the end part to The Pittville Radio and Electrical Supplies company. 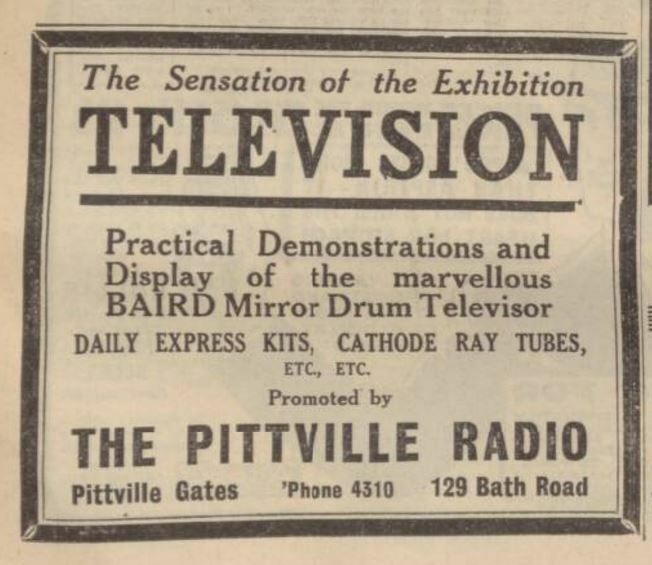 In 1934 Pittville Radio advertised a demonstration of the Baird mirror drum "televisor" at Cheltenham's Better Homes Exhibition, in the Town Hall. This was a form of low-resolution mechanical television, which featured in experimental BBC broadcasts in the early 1930s. In about 1935 the property changed hands again when Mr Cyril Stancombe, a fruiterer and fishmonger, took over. As well as fruit and vegetables Cyril sold fish and Cotswold rabbits for 6d each. Every Monday evening he drove up to Kilkenny, near Andoversford, and bought the rabbits for his daughter Doris to skin. This was one of her tasks for her wages of fifteen shillings a week. The fish was delivered from Grimsby by rail and then brought to the shop to be laid on cold slabs. The fruit and vegetables were purchased at Cheltenham market very early each morning by Cyril, who was often accompanied by Doris before she went to school. After school she would help again by assisting her father with the deliveries, being in charge of collecting the money. Besides the shop trade and deliveries, the Stancombes also operated a mobile shop, which was driven by George, with help from Olive. Housewives and cooks from the big houses would come out to the van and select their goods. Some of the less well off had their shopping ‘on tic’, paying a little each week until the bill was eventually paid off! After Cyril had been at his shop for about seven years the end property became available, when Pittville Radio sold up. Having acquired it, Stancombes shop became one of the biggest in Bath Road. It is also quite likely to have been one of the coldest with its open front! The shop opened at 6am and closed most evenings at 6pm except for late night Saturday, when it was 9 o’clock before the shutters came down. The work wasn’t over then as the ‘front’ had to be brought in and stacked inside. Cyril’s brother Arthur also had a shop at nearby Westal Green (see here). In the early 1950s, he bought the Bath Road shop from Cyril and his wife Emily. It wasn’t long after buying it that he sold it and it became a favourite shop for children of all ages! 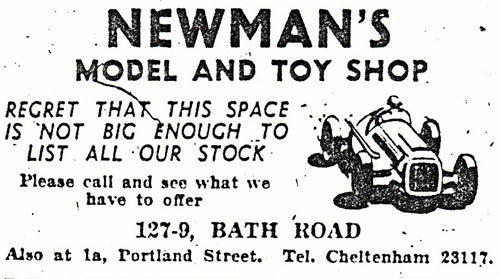 Newman's, the toy and model shop was run by Mr and Mrs Ivor Newman. They both worked in the shop which was also a service dealer for well known names like Hornby, Tri-ang and Scalextric. I am sure that many people will have fond memories of this shop and all its treasures and how many remember the train painted on the upper wall of the shop? Cheltenham Model Centre took over after Mr and Mrs Newman left – they have now moved to a bigger shop in the High Street. 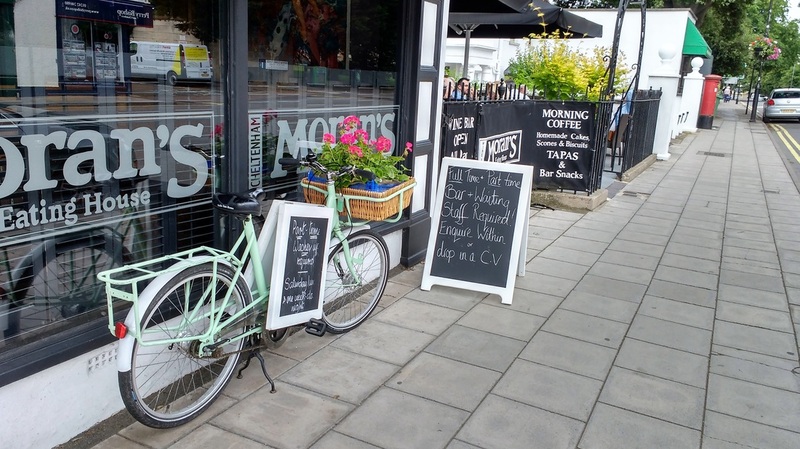 In 1983 the whole premises were bought by Mr & Mrs Moran and converted into a restaurant and wine bar. 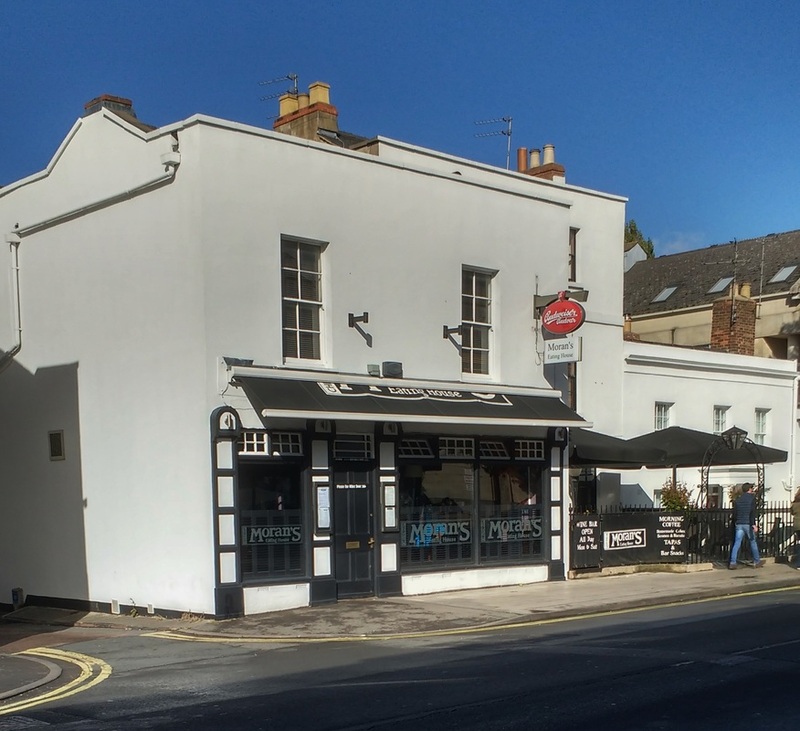 About eight years later it underwent major refurbishment when the adjoining property was bought and the restaurant enlarged. An outside patio area was also created.